by Aron Lund, editor of Syria in Crisis. According to rumors doing the rounds now, the Islam Army leader Mohammed Zahran Alloush has traveled to Amman to meet with foreign intelligence services and coordinate a purge of Islamic State and al-Qaeda elements in Syria. 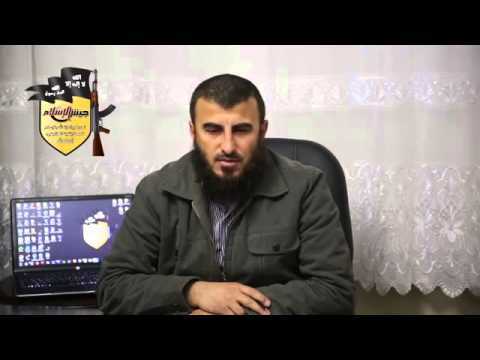 Zahran Alloush is the most powerful rebel leader in the Damascus region. A Sunni Islamist of the salafi tendency, he is the son of a Saudi-based Syrian theologian named Abdullah Alloush. He ran into trouble with the authorities long before the uprising and was held in Seidnaia Prison until June 2011, when he was freed in an amnesty. Upon his release, he immediately began to construct the armed faction now known as the Islam Army, which eventually grew into the most powerful militia in his hometown Douma. He now controls the Unified Command in the Eastern Ghouta, an area of satellite towns, suburbs, and farming communities on the outskirts of Damascus, which includes Douma. The Eastern Ghouta region has been under government siege for much of the uprising, turning it into an enclave; inside that enclave, Zahran Alloush is by far the most powerful leader. He is a controversial figure, however, and has been accused of silencing dissent by force. The Unified Command and its member factions are mostly Sunni Islamists of some variety, but with considerable personal and even ideological differences between factions. Together, they have fought hard to root out the Islamic State from the Damascus region, but they have so far cooperated with al-Qaeda’s Nusra Front (which is not part of the Unified Command). The idea of starting a war with the Nusra Front would be controversial among other rebels. Many are wary of Nusra’s extremism and international agenda, but they see no urgent need for diverting resources to fighting the group, which is held in high esteem for its ability to inflict damage on Bashar al-Assad and the Islamic State alike. Being a very useful ally, it would also be a very dangerous enemy. Indeed, some rebels would probably feel inclined to support the Nusra Front rather than Alloush—which is precisely why the topic is so sensitive. In a surprise move, Zahran Alloush recently left his stronghold in the Douma to go to Turkey, where he has been meeting with foreign governments and other rebel leaders. According to recent reports, Abu Mohammed al-Fateh, who is the leader of another Ghouta-based Islamist group, the Ajnad al-Sham Islamic Union, has taken over after Zahran Alloush as head of the Ghouta Unified Command. I have asked two representatives of the Islam Army about this. One says it’s false and has been denied by all involved. The other says it is true but only a temporary arrangement, while Zahran is out of the country. Whether or not he traveled on to Amman this week, Zahran Alloush’s trip abroad seems to be related to the recent Turkish-Saudi push to empower the Syrian rebels and reorganize the insurgency. A lot of things are happening at the moment, with the quietly Saudi-approved Cairo II conference for moderate opposition members slated to start in Cairo on Tuesday and another conference scheduled for after Ramadan in Riyadh. Meanwhile, President Khaled Khoja of the National Coalition—the Syrian opposition’s internationally recognized exile leadership—has ordered the dissolution of the Free Syrian Army’s Supreme Military Council, a more or less defunct exile body set up in 2012 to coordinate support to the rebellion. Something new will surely take its place. Recent reports suggest a reorganization into a two-pronged structure: the Northern Front and the Southern Front. While the insurgency in the north is a mess, albeit a successful mess, a Southern Front structure already exists, though less as an independent entity than as a label for the groups that are jointly backed and coordinated by Western and Gulf states operating out of Amman. As these pieces start to fall into place, many suspect that Zahran is being groomed for a bigger role in the new rebel leadership structure—or at the very least, that he is independently angling for one. He may not be the most popular rebel leader in Syria, but he is surely the person most likely to grab the presidential palace if the Assad regime starts to crumble. In a recent interview with the McClatchy news agency, he tried to back away from his previous hateful rhetoric against Shia and Alawite minorities in Syria. It is hard to shake the feeling that this was aimed at making him more acceptable to Syrian and international opinion. Now, a note of caution: there is no confirmation of these news yet. Instead, the most detailed version of the rumors about Zahran’s meetings in Amman comes from @mujtahidd, an anonymous account on Twitter that is dedicated to critical commentary on Saudi politics. Whoever or whatever is really behind the @mujtahidd account, it has an enormous following in Saudi Arabia and the Arab world, but there is no way of confirming these reports—so make of them what you will. What follows is my quick translation of @mujtahidd’s tweets, which are available in the original Arabic here. Zahran Alloush spent last week meeting with Saudi, American, and Jordanian intelligence in Amman hotels, in order to coordinate the situation against the Islamic State and the Nusra Front, and for other tasks. The meeting with the Americans took place a week ago. He met with the Saudis two times: last Friday between 14.30 until 16.00 and on Sunday at 20.00 in the Hayat hotel in Amman. Saudi intelligence was represented by Abu Badr, who is close to Mohammed bin Nayef. In the first meeting, Zahran Alloush was accompanied by Mohammed Alloush and Abu Ali al-Ajwa. In the second meeting, he was alone. The goal was to coordinate the war against the Islamic State and the Nusra Front. Alloush said that the war against the Nusra Front will be more difficult to justify than the war on the Islamic State, and that they will have to help him with that. Alloush was asked to coordinate with the Southern Front, which consists of the remains of what’s left of Jamal Maarouf’s troops and the rest of the mercenaries. A meeting was set up between Alloush and Abu Osama al-Golani, who is one of the leaders of this front. Alloush started coordinating with the Southern Front to fight the Islamic State and the Nusra Front in Deraa and Quneitra. With the Saudis, he discussed replacing the Islam Army flag by the revolutionary flag. The meetings were arranged by members of the Jordanian intelligence services. No fewer than ten were seen there and several of them attended the meetings. Despite insisting on the destruction of the the Islamic State and the Nusra Front in all of Syria, the main focus was on keeping the Damascus front in his hands so that he will be able to reap the fruits even if the regime is toppled by someone else. An interesting point is that the person known as Abu Badr asked in detail about the Muslim Brotherhood’s strength on the various fronts. It was not clear if the question was in order to push them out or to make use of them. An observation: the meetings took place in the Hayat hotel, but Alloush is living at the Crowne Plaza. Of course, they’re all in Amman. We ask God to expose all the hypocrites. — Aron Lund is the editor of Syria in Crisis, a website published by the Carnegie Endowment for International Peace. You can tell the quality of rebel force by checking the history, credentials and the behavior of their leaders. Alloush who bombed civilians in Damascus on many occasions is an evil uneducated thug regardless of what some thawrajiyyeh say to beautify his image, and the same can be said about most war lords in Syria toddy. It is not enough for thawrajiyyeh to expose the pitfalls of Assad regime and his followers, they need to come up with a better alternative, some boneheads here want you to believe that Nusra (aka jayesh Fateh) and Isis are better than the regime, most people disagree and that does not make them supporters of Assad they are simply against terrorism, all Syrians should join forces to fight terrorists regardless if they support Assad or not. Today Isis severed the heads of dozens of rebels in Aleppo and posted them on buildings !! A terrorist from a terrorist family. Zahran Alloush- the prodigal who prepared to carry out The criminal and malevolent will of Saudi Arabia and Turkey by proxy. His hands stained with the blood of innocent Syrians. For once you are right. He’s a Saudi, American, Israeli, Qatari agent traitor. The american arms manufacturers still benefit from the tensions in our rigion. Any “outbreak” of peace in the Middle East will hurt American arms sales. The viscousness of the Saudi regime’s assault against the people of Yemen is largely being ignored by western media. The Saudi regime has unleashed white phosphorous, a deadly chemical weapon, into civilian areas. The Saudi regime has bombed hospitals, schools, power plants, and other civilian infrastructure. The death toll has already surpassed 4,000 people, and is constantly rising, with the number of critically wounded nearing 10,000. The Saudi monarchy, the autocratic repressive agent of Wall Street oil corporations in the Middle East, is seeing its attack on Yemen go very differently than was planned. Yemen is not becoming further fragmented and divided. Rather than the Ansarullah organization and their allies being crushed, many are realizing that it could soon be Saudi Arabia that falls into complete chaos. The fact that King Salman cancelled his trip to the White House may be indicative of a higher level of confusion and disagreement behind closed doors. The US government may soon begin trying to distance itself from their Saudi puppets, as they did after the fall of Hosni Mubbarack in Egypt. # Guardian: Assad helping ISIS gain more power. Guardian: U.S. helped ISIS rise. Me: drinking vodka at 11am. #Assad has Putin & Khamenei. Jihadists have worldwide Jihadi sympathizers network. We have Obama. LOL. Where do guys like Zahran Alloush (lead article) go when it’s over? They have pretty aggressive expectations, unmatched by any relevant postwar competencies. I’m reminded of Sheikh Muhammad al-Yacoubi’s calm warning about the potential for anarchy, and reminder that fighters who are now with or against the regime must be able to find jobs and recognize that violence is not a profession. Write that in mega headlines for their self styled leaders. The new saudi king Salman and his brother (minister of defense) have decided to follow a (much) more aggressive foreign policy. And that has led to flare up of violence in Iraq (Ramadi) and Syria (Palmyra). ISIS receives a lot of money from individuals in the Gulf states, as well. The goal of ISIS is conquering Damascus and then violence will spill over into Jordan and Lebanon. The Saud clan would need an actual desire for that and It’s as easy for the Saudis to manipulate the US. The Saudis are perfectly free to run their own foreign policy, and they do, and the US is unable to disengage. The Saudi militaristic foreign policy is likely to prove catastrophic in the long run. the U.S. propaganda machine is working hard on three points. The first is to depict the Syrian government as no longer supported by its people and to sow doubt about its alliances with Iran and Russia. With the new support coming now that line is temporarily inoperable but will be revived when convenient. The second propaganda stunt is to deny that Jabhat al-Nusra is a real operative part of Al-Qeada with the long-term aim to attack the “west”. This claim is necessary to justify further U.S. support to the Nusra led campaigns in Idleb and elsewhere. There were rumors about al-Nusra rejecting al-Qaeda and attempts to invent some internal strife about the question. An AlJazeerah Arabic softball interview with Nusra chief Jolani was arranged to soften its image. But Jolani did not perform as AlJazeerah sponsor Qatar expected. He again declared full allegiance to al-Qaeda central and his obedience to al-Qeada chief Ayman al-Zawahiri. Nusra is thereby not “al-Qaeda aligned” or “al-Qaeda linked” or an “al-Qaeda franchise”. Jabhat al-Nusra is al-Qaeda. Jolani left no doubt about it. Hatred and vengeance is not a strategy and can not sustain a revolution, and violence is not a solution it is a problem by itself. people expect their lives to improve when they rise up against a bad regime, most Syrians today refer to the pre 2011 era as ” the good old days”, if that is not a failure of this uprising I do not know what failure is. An intifada led by sheikhs and financed by the GCC can not bring freedom and justice. You can not make chicken soup out of chicken poop. I hope you realize Ghufran that your comments are, without any exception, full of nonsense. Jokes aside I do tend to agree that the militarization of the revolution ended up giving Assad the upper hand and enough cover to demolish Syria into smithereens. Assad 2uw na7re2 al balad is a policy that is to this today being implemented with full force. What Syria needs and I believe this will be a daunting achievement but if it can be achieved it will save Syria, is to empower a third force not with weapons but with money to feed, house and educate Syrians so that they can help rebuild Syria. We need doctors, engineers, and psychologists more than ever, and if we help educate the refugee children with these invaluable knowledge. Syria today might be lost, but tomorrow brings us a new day. Alloosh was allowed to leave Doumaa to travel to Turkey because our Syrian government believes he is incompetent. We don’t want anyone competent to take his place. The Saudis, by the by, run ISIS and, so, why would they want to have Alloosh fight it? This article is pure propaganda designed to make it appear as though the murdering race of rats called the Saud family is innocent of Syrian blood. They will find out very soon that our memory will not be erased by the sight of their skins hanging to dry on the walls of the Great Mosque. Saudi’s recent obsession with the MB, and running away from it in Egypt, tells me they are worried about it, not that they are interested in exploiting it. No guys, the Saddam Regime has always controlled IS/ISIS/Al-Qaeda in Iraq/Zarquawi, long before Saddam planted them in the no-fly zone, long before GW invaded. Welcome to the forum Max. More genuine faithful Syrians are joining us on this forum. At this rate we will flip the table and force the authors to change the views on this website. You give a lot of honour and power to the “US propaganda machine”. Those three points you list, by some amazing extraordinary coincident, you will find are identical to the views of many Syrians who are directly affected by what is happening there. Syrians who have never read one word of the English language press and have zero contact with any American source. You seem to be setting yourself up for cognitive shock and lonely confusion if you ever get among the 98% of Syrians who have suffered irreplaceable loss, pain and psychological damage through Assad’s actions. Start with the Allawi community who have reportedly lost one-third of their men of military age in this disaster. Syrian people don’t know anything about “American propaganda”. They only know what has happened to them. What do you consider to be faithful Syrians? Pro-regime? And I would submit to you that it is not more numbers needed on this forum, but better access to facts as well as ideas. There is a lot of speculation being done here, which is also fine, but it doesn’t make it true. Keep your snotty nose out of the Alawites affairs. You contradict yourself. What can you do to get us to believe anything you are saying? Please don’t try explaining issues pertaining to logic to Jammie. And don’t try to point out where he contradicts himself. Jammie’s a buffoon, an ignoramus, a lowbrow, a booby, a muttonhead. He wouldn’t know a contradiction if it walked up and bit him on his one remaining testicle. Example of Jammie’s inability to “get it”. In 5 above, I told Alan he forgot to blame the USA. I was joking. I’m always ragging Alan because he’s such a one-way dipstick. Jammie thought I was serious and congratulated me for being right. And I’m thinking, is this dummkopf for real? Some people you just need to ignore until they implode and drop off the face of the earth. Your last post shows you’re winning 7 to 2, so I think you’re right! I’ll make it 8 as soon as I post this! Yes, Nusra terrorists supported by Turkey, financed by the GCC and armed with American weapons are now in control of more than 90% of Idleb while Iran and Russia were mostly watching. The plan from day one was to crush the Syrian army and end the Syrian state in the name of freedom and democracy. Syria with the help of her “friends” ended up with millions of refugees and vast destruction and a real threat of partition. Assad regime sinks deeper into its black pit of contempt for Syrians. Iranians brought in to execute Syrian soldiers to force them to keep killing other Syrians. Here’s the picture I am forming as you get siller, mocking the Syrian crisis. You are one of those sitting at the screen in grubby underwear, gulping something from a can, in a litter of empty fast food containers. Avoiding doing your homework, bored with PlayStation and online looking for “fun”. Turkey. Political Islam and dictator ambitions stopped at the ballot box. Erdogan forgot which century he is operating in. Washington still engage in endless provocations, dirty tricks, lies, and attempts at bullying. But probably no “hot wars” with a Russian superpower Like all thugs, Washington knows it has to be careful not to go too far with an adversary capable to send it to the hell. Maysaloun is a brilliant Syrian. Intelligence is very appealing…quite the contrary of some samples here… I don’t know but I really truly yet to find an intelligent pro regime. Well dear Tara, stupid is hereditary after all. The rise of pro regime comments lately coincides with the disappearance of the numerical captchas in the comment section. Math can be hard, especially when you run out fingers and toes to count. Anyways, going to go have some Nido enriched with Ibn T, like all sunnis do these days as I have read on here. How is being anti-regime, “sectarian”? People from all walks of life hate the regime. I made it clear a long time ago that I dislike the old and the new ottomans but as much as I despise Erdogan and his government I have to admit that pro regime media and pro regime posters’ jubilation at Erdigan’s party loss ( or half loss) in parliamentary elections was a form of black comedy when we remember how albaath and then the Assads allowed no opposition and no real elections since 1963. Syrians have the right to criticize the opposition and their violent jihadists but one should always remember that the bloody dance in Syria required two partners, that dance will not stop until one dancer passes out or the party comes to an end, many foreign powers are doing their best to keep the dancers on their feet. By the way, I used to read maysaloon’s comments but he like many of you is unable now to think outside the box. I have been upgraded to a premium user on this forum and I don’t need to provide captchas control in the comment section no more. Faithful Syrians are like Walid the Drum Mouallem who shoeshines every morning. Belorussia is calling however a Belorussian mafiosi may deflate him and take his money. Or he will do what only Arab regime men are capable of doing: more important than viral drugs, more impressive than landing on the moon, more daring that fetal surgery, more complicated than Rover landing: COMMITTING SUICIDE WITH FOUR BULLETS TO THE BACK OF THE HEAD. No, that is not accurate. People from all walks of life love the life in their towns, so they certainly want to eliminate the fouling proxy warriors from Zio-puppet f***n countries, who have committed the atrocities against the population. I think the situation is much more complicated. People are genuinely conflicted over who to support. The regime destroyed most of the moderate opposition. Since most of them were unarmed protestors, it was relatively easy. Now the armed opposition is almost entirely salafi, an ideology that historically doesn’t sit well with most Syrians. Motives are always difficult to ascertain, and again, declaring that someone’s motives was this or that is a matter of speculation. Still, it’s difficult to understand the example of Zahran Alloush without attributing a motive. A salafi, he was released by the regime at a key point early in the uprising. Improbably key timing. Why release the extremists while filling the prisons with the moderates? It is unlikely that it was because of a shortage of prison cells. Then there is the story of humanitarians like Razan Zeitouneh. She was kidnapped in rebel territory in 2013. No one claims credit, but she has essentially “disappeared”. She was a strong voice for moderation and a critic of both the government and some of the opposition, but it is unlikely that it was the government that captured her. Morely likely, though he denies it, it was Alloush or some other rebels or less likely just a criminal venture to get ransom. It is a conundrum. But it does not make most people “closet shabbihas”, just people who have run out of options and don’t know where to turn for help. People just get to pick which of the evils they prefer. I, for one, am glad that Erdogan received a slap on his face. In the past years he has been acting as a popular arrogant dictator. The results show that Turkey remains a strong democracy, stronger than any leader. They also show that most people, anywhere in the world, do not want to be ruled by a dictator, and do not want to be ruled by religion. “More recently, Iran reportedly executed three Sunni commanders after taking over the fight in northwest Syria after key losses to rebels. This slow-motion collapse of the Syrian military and a reliance upon foreign support has led to an abandonment by the Syrian state of areas deemed non-vital to the continuation of the Assad regime. Largely, these forces are now based in Damascus, Homs, and the Alawite stronghold of the Syrian coast from where Assad draws most of his support. Absolutely rubbish and nonsense, only Rustom Ghazaleh tried to wave his tale and when you do that somebody has to stomp on your head to be an example for others. I dare you naming the other two Sunnah commanders, simply because they don’t exist. As for your desperate Yahoo link who the hell is “Jeremy Bender” to write and analyze about Syria? He’s a wanna be kido who writes about everything trying to get anything, just like you. Jammie Baby, can’t you read the writing on the wall, boy? It’s over. The Assads are gonna end up either bloody dead like the Ceaușescus, or living in exile in some Zimbabwe shithole. Everybody is against them. If the jihadis don’t get them the Yankees will. Don’t pin your hopes on the Russkies or the Persians. The Ayatollah will sell Bashar down the river to get a deal with the West. And Putin doesn’t have the reach. It’s over. And it’s Bashar’s own fault. All this started with a few teenagers and some graffiti in Dara’a back in 2011. The Police could have paddled their behinds, given them a stern lecture about showing respect for the President. But no. They pulled out their fingernails and toenails and beat the holy hell out of them. All for a little spray paint. Rubbish, that’s one of your wet dreams with your SyriaLover or maybe the street girl. This is the ultimate lie of all times, give me an evidence that this incident actually has happened? give me the names of these 15 alleged kids? give me interviews face-to-face with them? … It’s all media work by Aljazeera and Alarabiya. You released them from prison and they still are not satisfied? Oh my! What a bunch of ungrateful losers! What more “freedom” do they want? BTW – Jamal, I am starting to doubt you are not authentic. Perhaps you are here with the purpose of pouring oil on fire. Take up your weapons and go to defend Assad´s Damascus instead of waisting time. You believe in Assad, go and fight for him. HOPEFUL (#55) I think you’ll find my description of JAMAL in #33 sounds right. He needs to turn off his computer, wash his face, get dressed, clean up the junk food and soda can litter and get back to his school homework. It’s ugly to see someone treating Syria as a subject for games and entertainment. We’ve had them here before and they got kicked off. Stop jamming on others Sandro! I did not comment one time with the content of calls for fighting. While your desire to escalate has not been interrupted throughout the period of my reading your comments! Any hope of U to take the rifle and go to fight the Iranians instead of BIBI ? I hope you are right because it could be worse! He could be a paid agent by the arms dealers, human traffickers and regime insiders who get more wealthy the more the war drags on. For all who still stand loyal to the eyedoctor, someone was couragous enough to collect some of the best mhenbak mania thoughout the country. The dust is clearing and I’m again cheering proudly for the hero Syrians of the FSA, fighting fiercely to defend and win back their country from Hezbollah, Iranians and ISIS (all proxies for cowardly traitor Assad). The FSA are the only ones with an authentic dog in this fight and they are showing they mean it. They are now on a roll, cutting through the trash barriers of Assad and his non-Syrian helpers. Millions of Syrians are depending entirely on the FSA for their future. Only the FSA can get rid of the Syrian-hating Assad-Iranian team and ISIS, and then Syrians will pour back home, no longer afraid of attacks from the regime and desperate to get on and rebuild their lives and country. Hezbollah, Iranians, ISIS will be sent packing, with nothing gained and no rational explanation for what the hell they were doing in Syria. Assad will be remembered as linked to them. The FSA will be hailed as winning back Syria. You have let me feel 5 years younger with these nice pics. These were our daily scenes in Damascus. We knew Assad was evil but we never imagined until which degree. To the burnt out cynics, smartasses and Assadists who mock and dismiss this vision and effort: Have you got a better one for Syrians? “The Syrian Coalition held the second consultation meeting with representatives of the Syrian rebel factions today in Istanbul to discuss plans for the formation of a joint military command and demands for reforming the Syrian Coalition. The conferees also discussed issuing a joint document to act as a basis for laying out a comprehensive vision for the future of Syria. “The participants emphasized the integrity of Syria’s territory and the unity of its people, and stressed that rebel fighters will keep fighting until the Assad regime is overthrown and all its allied sectarian militias are expelled from all Syria’s territory and all the displaced people return to their homes. Welcome back to the clear, strong voice of the Free Syrian Army (FSA). Back to the spirit they started with. COMMENT: They talk non-sectarianism, unity and nationalism in their own ranks, linked to their aims for Syria. It won’t take much to sell this to all Syrians who just desperately want a normal life and a safe home. FSA does not exist, joke yourself not. Yeah show your real skin you sick Sunnah. You believe you’re higher and better than the Alawite peasants, you think you’re smarter. Reality check … You’re NOT. Face it that’s how democracy works and you must learn to accept to be rules by other in due time. The so called Zahran Allouch is sleeping with MI6 now in London. Shame on you UK, you’re giving a terrorist a visa while millions of really desperate people being rejected. I encourage our comrades in the UK to organize a protest near the HomeLand department. بعدكم زي ما انتو ما تغير شي على إلي لألك و منائرة و مطاحشة لك شبكون منكلبين على الدنيا. Losing the 52 marks the end of Alawi ruling era of Syria. Now having this achieved the Syria Sunni brethren and other backgrounds should sit and talk to reconcile. Starting a reconciliation process is a must otherwise all Alawis are facing a definite death threat. Let’s all put sectarianism behind our back and move forward. All eyes are one the Druze of Swaida.As the southern front forces who are mostly from next door Dara’a tries to take over Tha’ala Air Force base that have been raining death and destruction for 4 years on their towns and villages. The base is located within the Druze territory and they have been neutral so far, will they stand aside and let them take it?or fight with regime? The moment of truth is now. The time to watch from the fence is up. the Druze village was under Junblat protection and its residents sided with rebels based on Junblat’s recommendation only to be asked to denounce their faith, change the way they dress and forced to send kids (10-14 year of age) to Alqaeda school to learn “real Islam”. The travesty is not only that Nusra is killing civilians but also that Nusra is receiving support from people and governments in the region and beyond, Syria my friends is now a place where foreign governments and terrorist groups try new weapons and experiment with fresh ideas of savagery and thuggery. Kamal Jublat the Lebanese Druze leader issued a statement explaining what happened in Idlib and asking the Druze of Syria to not fall into the regime propaganda machine. It was a dispute between a regime supporter and a Nusra fighter that escalated and was put down quickly. خصوصاً لناحية ما تم تداوله عن ذبح تعرض لها الموحدون الدروز، ويوضح الحزب أن ما حصل هو إشكال وقع بين عدد من الأهالي في بلدة قلب لوزة في جبل السماق وعناصر من جبهة النصرة حاولوا دخول منزل أحد العناصر الذي يعتبرونه مواليا للنظام السوري، وقد تطور الإشكال إلى إطلاق نار أوقع عددا من الشهداء. ولقد تم تطويق هذا الإشكال ووضع حد له في إطار من التواصل والتعاون مع كل الأطراف الفاعلة والمعنية”. وأضاف : “كما يستغرب الحزب حملة التحريض المنظمة التي قامت بها بعض الأوساط السياسية والإعلامية بهدف تأجيج المشاعر وإذكاء نار الفتنة داعياً المواطنين إلى عدم الأخذ بها لا سيما وأن ما يحصل، على جسامته، هو جزء من المعاناة التي يعيشها الشعب السوري التي تعرض فيها لحرب طاحنة وأودت حتى اللحظة بمئات الآلاف من أبناء الشعب السوري وتهجير الملايين منهم إلى دول الجوار”. وختم : “يدعو الحزب إلى التهدئة والتروي وعدم الإنجرار وراء الأخبار غير الصحيحة وغير الدقيقة في هذه المرحلة الحرجة التي قد ترغب أطراف عديدة خلالها أن تصطاد في الماء العكر”. Heheheheh you’re a retarded dweeb heheheh Kamal is dead since March 16, 1977 you idiot. Unless they have tweeter service now underground. You’re a defeated soul, you’re a shame to every Alawite in Syria, you’re the definition coward. Souwieda is near to the no returning point. The wisdom of druze people is being challenged. Joumblatt is pushing their partners in Souweida to leave the regime side. The vast majority of druzes in Souweida are against following Assad strategy of ¨Assad or Nothing¨. If Souweida takes the decision then Assad is a dead man. The revolution that created modern Syria started in the druze lands 1920´s, the start of a modern Syria may start in Jabal Druze too (or Jabal Al Arab as Assad named it). An agreement among FSA and Druze Leaders is possible. News about Assad in danger, could be killed before the end of month of June. Life for Syrians under ISIS: sinister threats, bizarre rules and cruelty. COMMENT: The FSA fights with full strength to defend and free their fellow Syrians from this nightmare. The Assad regime in contrast, stays away and avoids interfering, using the ISIS distraction to keep up its vicious barrel bombing of ordinary Syrians. But if this made you so excited like a little girl, I worry what will happen to you when you soon hear about the “tactical withdrawal” form the Tha’ala airbase by your side. In the mean time watch this fresh YouTube clip of a Mig from your air force being shot down in Dara’a about an hour ago. The incident at Idlib between JAN and the Druze residents is an isolated incident that both sides are responsible for.However there are warmongers who are taking this opportunity to incite the villagers to react. The same narrow minded people are inciting the Druze of Sweida to fight the FSA who are fast approaching the city. Reason will prevail and the Druze will know what path to take.the regime is dead and IS are approaching from the North East. It’s only natural that they stop sitting on the fence and hoist the Free Syrian flag in the city centre. sure, lets request that they strip the hyena athma of her citizenship and take the children from her before she turns them into monsters like their father and grandfather. Assad will empty the druze capital from heavy weaponry and facilitate the attack of ISIL against Sweida as a punishment for Sweida not sending their young men to the syrian army. If druze do not make a deal with FSA in the coming days they could be finished by Assad´s ISIL. That’s a good idea about stripping anorexic mafia madam Asma Assad of her British citizenship. And even harsher, block her international internet shopping. But the kids shouldn’t be taken away to safe ground. They have very sick DNA as we see from the family tree. They would grow up to be psychopaths with tiny brains even if rescued. But Syria had its own with Maher and Bassel Assad – just better controlled propaganda. And it was idiot propaganda that disguised the sick and dead-headed nature of their weak brother Bashar when he first became “leader”. But DNA will come through. The Assad regime was pre-destined to bring Syria to its current state, only quicker if Bassel had survived. As the smoke and dust clears. We are watching Iran desperately sinking more and more $ billions, manpower and its reputation into Syria and Iraq. And FAILING. Big time. The people of Iran won’t be grateful for the effort. They suffered too much in the first Gulf War to agree to what’s happening – if they knew about it. I can’t believe you’re sharpening your long knives for poor little children. Are you trying to punish them just because they were born advantaged with rich educated parents? If you follow this principle then you should punish all the white folks in the East coast simply because they’re advantaged. Good luck with that. FYI she passed the citizenship to her kids as well which means the British governments and troops are forced to come and rescue them if any evacuation mission puts into place. Beside if you want to strip all officials and their family members from the second citizenship then you need to process millions of applications ya habib. We always thought ahead and prepared for dark coming days, and almost all officals Alawite/Sunnah send their spouses to give birth in Canada or USA to gain the citizenship. See it’s a choice. Poor JAMAL, he needs to go and look up “DNA” to follow this discussion. He’s still sitting there in his grubby underwear in a deep litter of junk food wrappers and cans looking for entertainment online with SyriaComment. But HE’s become the entertainment as he struggles to play. He should go back to his PlayStation if he needs to keep postponing doing his school homework. And he hasn’t kept up with the news about western countries rushing in laws to strip dual citizenship holders with links to terrorism of citizenship and refuse them right of return. Poor kid JAMAL is in over his head here – as he would be everywhere he tries to join in. 1- Druz are minority and ALL minorities are with Assad, joke yourself not there will be no defection of jumping ships. 3- Altha’lla airport will not fall, we will blow it up into bits and pieces along with all Syria but we won’t allow it to fall. 4- Druz have one option now, send more conscripts to fight along the great Syrian Arab Army to protect their territories. God forbid, what are you talking about? A wet patch appearing on JAMAL’s chair? He must hold dual citizenship. He’d better change his underwear and do some basic research. Clearly you’re the leader of this paid online revolutionists, and for that reason I’ll virtually discuss an imaginary scenario with you. 5- The new government should reflect all Syrian backgrounds of faith and ethnicity according to an agreed percentage of each. Will come around with above terms? Jamal and his like-minded comrades will be lucky if they get winds of the right moment to put their snickers and start their marathon to Beirut before they get blown to bits and pieces. Wet dreaming of negotiated settlement? Hehehehe…..
You criminal prefer blowing up all Syria before other rule it. I think that Syria , the way we know it, is gone, so will the diversity of it’s people. We are going back to what it was in the old ages, (((City states,))). The 52nd Brigade was the second best unit of the Assad army. An elite force, consisting of infantry, artillery and armored elements — a well-resourced -trained -motivated Alawite unit. It was stationed around the town of Dara’a, in the southeast of Syria, close to the Syria-Jordan and Syria-Israel borders, controlling the southern roads to Damascus. This is a region whose population is mostly tribal Sunni Muslim and Druze. The brigade is no more, as after only eight hours of fighting, the 1st army of the rebels destroyed it, and in the process 400 Alawite soldiers were killed, with many more injured. This is a resounding defeat for the regime; one which leads to some important questions: What is happening with the once powerful Syrian army, built to be a strategic match to Israel’s army? What are the implications for the Alawite community; and above all, how is Iran connected with all that? Put bluntly, Bashar Assad is no more the real ruler of what is, even nominally, under his control; no more than 20 percent of his territory. He is the messenger boy of the Iranian regime. It is not just the pro regime people who lied to their audience, it is now clear that pro rebel TV and internet jihadists have lied from day one about events on the ground and the true nature of the rebel forces and their ideology.It took a couple of years for the average outsider to figure things out but most people, thawrajiyyeh aside, are ready to admit that the war in Syria is mostly between Ikhwanji-Alqaeda type rebel groups and troops loyal to Assad and his regime, the so-called FSA only exists on facebook and on blogs like this one. The conflict has an obvious sectarian nature, there is no presence for any shia or alawites in rebel held areas, however millions of sunnis still reside, have moved or are still moving to areas controlled by the regime. The next time you see a thawraji claiming that the rebel force now is not an islamist jihadist movement tell him or her that you can lie to some people for a period of time but you can not lie to all people all the time. Even in Daraa, Swaidaa and Qnaitra, most of the fighters attacking cities and military checkpoints are members of Nusra/alqaeda (and their step children brigades), there is no national rebel force in Syria today, that is why the Druze in Swaidaa will not listen to Junblat and others who are trying to beautify the pig with the black flag !! Hoping the good news means a quick end to this nightmare for your people. Assad was able to come back after most of his enemies wrote his obituary in 2012 and started appointing people for top positions in what they called “revolutionary government”, the same thing is happening again except that it is more serious now and less likely that a united Syria will emerge ftom the rubble especially after the resurgence of Nusra and Isis who will not allow a civilian government in any area under their control. Unless you are an ikhwanji, Alqaeda supporter, GCC, Tutkish or Israeli political pimp you should be very suspicious of what is being cooked for the old country even if you want Assad and the Syrian army to be defeated. I doubt that Iran and Russia will let Islamist rebels rule Syria even if they consent to Assad departure or a semi partition of Syria, Syria is too important for one side to enjoy a decisive victory or suffer a total defeat. The likely winners will likely include Israel and the multiple war lords but you, my Syrian friends, will only have your memories and the joy of counting the dead bodies on the other side. We are good, we are right and we are so freaking beautiful !! Are you an Assad supporter? If so, what has he done for Syria? If not, what type of government would you like to see? Don’t show me your teeth you dirty Zionist, joke yourself not that we will come and get you and push you to the sea even if Syria (God forbid) goes into partitioning. What’s worse, dirty Zionists or ISIS or FSA? I’m guessing were not at the top of the list because Assad helped Israel so much by keeping the Syrian – Israel border so quiet for such a long time. If you see the good Doctor, please give him a huge “shukran” from this Zionist. The war now is not about Assad, he can leave tomorrow and very few things will change because most of Syria toddy is occupied by jihadists and hired guns who pledge allegiance to foreign countries. Many of us did not want this war to start and warned that the country will be destroyed and the dream of freedom and democracy will be replaced by the nightmares of destruction and misery. Israel now wants the international community to approve its annexation of the Golan and is in bed with members of the Syrian opposition and Islamist rebels who go to Israel to treat their “wounds”. Opposing Assad is one thing but selling Syria to Israel and turkey is another, only an ikhwanji fool would prefer Nusra over a secular government, that government does not have to include Assad, he should not have been crowned in 2000 and he should have resigned in 2011. There’s our boy Jammie again with his “Joke yourself not.” Such a sweet kid. Don’t you just want to take him home to meet Mom and Dad? 2.) Destroyed Syria, by keeping the people down, being against the We $t, and letting foreign fighters in. What do you think of my settlement proposal I suggested to Hamster? Will you agree on my conditions? /I think that Syria, the way we know it, is gone, so will the diversity of it’s people. We are going back to what it was in the old ages, (((City states,)))/. the Western values already spread everywhere. The eyedoctor has humor, Qatar was accused by the regime for supporting terrorism in Syria at the UN Council. See how this mhnbak is defending the regime. Real life may sometimes be stranger than fiction, but never stranger than mythology. So someone who appears rarely on a blog is not necessarily the “mahdi” of the blog. But of course, if you dig a little they like to be in countries where the rule of law is the norm yet they have never allowed for the same for 99.99% of Syrians to have. They also like to have apartments in Austria with which they established a relationship after the Austrians deployed UN troops on the Golan and this is where Bassil put in his fortune and was “married” after he died so that taxes could be reduced when it was time to withdraw and dispose of the inheritance. 4. The regime is withdrawing to areas that it can defend or so it thinks but the reality is that it can only defend if massive support is provided from the outside. 9. The efforts of organizing the opposition now are not to finish the regime more quickly but to insure that IS does not take advantage of the collapse and establish a presence in Damascus. So my dear Syrian Hamster do not pay attention to distractions; and read carefully how the minorities are the first to abandon their Syrian identity as we see Arslan and Wahab in Lebanon and Jumblatt as well talk of Druze regardless of their being Lebanese or Syrian. One more time it is proof beyond doubt that the Syrian Arab National identity that we were led to believe existed was nothing more than a screen to insure that the regime remains in the hands of a mafia clan within a minority that is eternally victimized in its mind of centuries of Ibn T’s oppression by intrinsically evil subhuman Sunnis; those that are of two categories: the ones that are corrupt and we use them to steal and destroy and those that we kill and imprison and torture. If you need more proof that the U.S. government doesn’t have a strategy to deal with ISIS, here it is. It doesn’t get much more blatant than this. The group has captured billions of dollars in American-supplied military equipment, is expanding its territory despite the western world bombing it, and recently leaked documents prove the U.S. predicted — even encouraged — the creation on ISIS. All the while, U.S. trained fighters continue to join the ranks of the ‘Islamic State,’ using weapons that American taxpayers paid for, against other forces equipped with U.S. financed military equipment. In Denmark, they’re getting tired of all the smelly Muslims wandering around, mucking up neighborhoods with their keffiyahs and their hijabs and their AK47s. The anti-immigration vote is gaining traction. And the Danes are doing provocative stuff, like in a few days, there’s gonna be a Mohammed cartoon fest and the guest of honor will be that crazy lady from the shootout in Texas. People across the Arab world have been expressing solidarity with child victims of barrel bomb attacks in Syria – and opposing President Assad – with the hashtag “we are the child, you are the barrel”. The use of barrel bombs has escalated in recent days in Aleppo, according to the UN. Pictures that claim to show what the weapons do to child victims (which we haven’t been able to verify – and which are mostly too graphic to show or link to) have started spreading on social media networks, under an Arabic hashtag which translates as: “we are the child, you are the barrel”. And the tag gives an insight into the broad coalition of individuals who now oppose Assad in the region. One of the first people to tweet the hashtag was Mahmoud Owaimer. As a Palestinian living in Gaza, Mahmoud told BBC Trending that the suffering of Syrians reminds him of the recent war with Israel and the shelling of Gaza. “What hurts is that we’ve seen the war in Syria going on for four years and we can’t see any end to it. It would move anyone, wherever they are, to want to speak out. Unlike the Syrian rebels that you treat and arm? Who do you think you’re fooling? Is Hamas “protecting” your border too? And where are the actual news, like the massacre of 20 Druze, instead of worthless rumours about this and that Wahabite caveman? Druze in Swaida and their spiritual leadership dealt a blow to islamist rebels, Israel and Junblat when they decided to defend Thalaa air base and the outskirts of Swaida thus siding with the Syrian army. Rebels tweeters accuse Druze of abandoning the “revolution” and supporting Assad and “promised” that Druze in Syria will regret this decision. Regardless of where you stand on the Syrian war issue, you have to be a fool to expect Druze to support the terrorists of Nusra et al after Druze watched the actions of Islamist rebels which were in sharp contradiction of opposition Taqiyyah-practicing internet blabbers propaganda, the latest achievement of “moderate rebels” was the slaughter of 3 dozen Druze civilians in Idleb. Druzes believe themselves inspired by God for their eternal survival and realm but everything has a limit. This Assad assassin regime has it too. Druzes of Syria are derailed and will suffer extreme disaster if they are not able to leave Assad alone. Worse even, in case Assad succeds, druze will be responsible for the consequences. Junblatt is the most brilliant druze figure and he has spoken loud and clear. All druze personalities in Sweida are rural, peasant and religious people with a limited skope of global politics. Most of them still believe in magic, esotherics rituals and future predictions. This is not because of the druze faith, this is due to alientation they have suffered for the last 150 years. Worse even, Sweida is fully infiltrated by Assad agents and totally corrupted by clientelism. The mental disruption of corruption is spread among all state officials in Sweida too. This makes things more difficult for Sweida to make a change. Sweida rest in peace. What a pathetic article and site. Listen up imbeciles. Syria will prevail because the Syrian people are behind their Government, no matter what sites likes this and others say.